Title = Philadelphia's Story: The true story of the United States of America's beginning. Description = Historic Philadelphia and US history. Free educational information about Philly, Montgomery County, Plymouth Meeting, Roxborough, Manayunk, and the Wissahickon areas. Learn more about the History of the United States of America. Q: Where can you find some of the United States of America's oldest relics and richest history? A: In the Roxborough-Manayunk-Wissahickon section of Philadelphia. Rarely would one think of Roxborough as having Philadelphia's oldest houses or a rich history -- except for those who follow trails through Wissahickon Park or closely examine structures along Ridge Avenue and the surrounding roads. Let's go way back and look at Roxborough's past. Swedish settlements started in Philadelphia as early as 1639. Gradually, they moved west of the Delaware River to the surrounding suburbs. 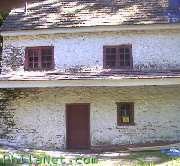 Philadelphia's oldest house is on the West River Drive and was built by Swedes in 1660. 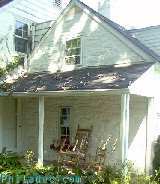 Outside the house, a sign reads; "Boelsen Cottage 1684." It was surveyed by Thomas Holme in 1684, but built in 1660, as a sign closer to the house reads. The first Swede to come to the current Ridge Avenue was Peter Lindstrom, in 1656. The road was a Native American trail leading to Barren Hill and was surrounded by large plantations where corn, beans, and tobacco were grown along with fruit orchards. Ridge Avenue was called the Manatawney and the surrounding area called Manatawna. In 1680, the Court of Upland in England appointed Peter Rambo (a local Swede) to be in charge of maintaining the Manatawney. There are still Rambo's in Roxborough and Manayunk, and they are recognized as Philadelphia's first family. William Penn arrived in 1682 and was amazed at how well-organized the plantations in Manatawna were. In 1690, the names were eventually changed to Ridge Road and Roxburgh (pronounced rocs-burr-ah). Roxburgh was eventually changed to Roxborough in 1707. The area was considered prime location for farming and milling. Richard Townsend, who arrived on the "Welcome" with William Penn in 1682, built the first mill on the Wissahickon. 1682 also saw immigrants from Germany and Holland into Germantown and Roxborough in great numbers. Now known as; Roxborough, Manayunk, Wissahickon, Germantown, Mount Airy and Chestnut Hill; was then collectively, German Township. William Penn had eleven tracts of land drawn for Rocks Burrow Township. It extended from the Schuylkill River to Wissahickon Avenue and from the Midvale Avenue area to Montgomery County (Whitemarsh). Roxborough to date, is the only place that maintains the same boundaries given by William Penn. 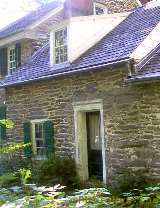 Philadelphia's second oldest house is along the Wissahickon Creek. It's original two-room section dates to 1685. Many of Roxborough's early settlers lived in log cabins. The last five standing cabins were demolished by the end of the 20th Century. On Northwestern Avenue, on the Roxborough side, there is a house which contains one original room from a 1690 house. A barn built on the property shortly after remains fully intact. Two of the early recognized families were Rittenhouse and Levering. The Rittenhouse Family had the first paper mill in America in 1690. A house from 1707 stands within the Rittenhouse Site. The site is a National Landmark. Roxborough also had a religious sect called the "Ridge Hermits". They were educated men who lived in the woods surrounding Hermit Lane. They were considered to be conjurers. The one-room house of "Kelpius the Mystic" still remains hidden in the woods (accessible) and dates to 1695. 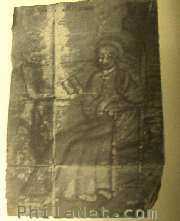 Dr. Christopher Witt (a Ridge Hermit), painted the first known oil painting in America of Kelpius. Besides the growth of mills and farms in Roxborough during the 1600's, The population of the Germans would eventually grow and migrate to the "Dutch Country" as Mennonites and Amish. One should keep in mind that they first were in Germantown and Roxborough. At the close of the century, Ridge Road would extend past Norristown and toward the Perkiomen Creek.